Which person do you associate with the vibraphone? Right, it's Roy Ayers. Roy has a deep influence on many artists. Among these one can find Michael Ortega, who had the opportunity to meet Roy Ayers while working as a chef during Roy's 1976 tour in San Jose. Michael's music is a mixture of Roy Ayers and Paul Hardcastle, of Acid Jazz, Smooth Jazz and New Age. Michael comments: "I've take a winding path to this album release. It's taken me into Fusion, Funk, Punk, New Age , Soul, Salsa, Techno and Hip Hop." "Man By The Bay" is Michael's debut album, which will be released in November 2002. An acoustic proof for his versatility and wealth of ideas. At this time, when many Smooth Jazz are copying repetitive themselves or others music, it's delightful to hear some originality. The album is full-packed with 16 tunes. The first tune Scattered Showers has one hypnotical main melody on which Michael improvise with his vibraphone, drum programmed rhythms and keyboard sounds. One can hear the typical grooving Acid Jazz shuffle on Highway 1. This tune is swinging and let you move. Comparable with the best of 3rd Force. What was indicated on the second tune develops on the third to an R&B highlight. Man By The Bay features the impressing voice of Eddie Hall. This tune is worth to buy the whole album. The tempo slows down to the contemplative Storm In Winter. The slow piano piece increase while the synthesizered sounds increase. A conglomeration of rhythm instruments heat the movement. But the sound keeps flakily and hovers. Follow Michael deep into the grooving sound of Pleasure Point. Paul Hardcastle is greeting. By the way I am a fan of Paul's music, so I also like Michael's. A bassy synthesizered wave combined with Michael's vibes propulsed by drum programmed rhythms. West Cliff Drive is anew such a hypnotical groove already presented in the first tune. Anything For You is a smooth slowtempo R&B song interpreted by Eddie Hall accompanied by Michael's vibes and Noel Catera on sax. Some Smooth Jazz is to hear on Open Arms. Stuart Wade recently complained on the forum of contemporaryjazz.com: "...labels are afraid to go with tracks containing instruments like flutes or vibes because they dont think the people who control the format like the sound of those instruments..". Well, here one can listen to an album, which should become choose by the radio stations especially because of the vibes. Eddie Hall sings Stroke. A slow R&B enriched with Michael's keys. Noel Catera 's sax is outstanding. More solo please! Lighthouse Field has some more Paul Hardcastle flavor. Can't Stop Falling is a wonderful slow R&B featuring Eddie Hall's vocals and Danny Hull's sax. Unfortunately this tune is not #11 as described in the cover lines but track #13. So don't get confused by this error. The mainweight of Almost is synthesizered based. I consider this tune as a techno/New Age tune. Moontribe Gathering has a funky attitude, a record with extensive utilization of vocoders. Michael calls it "Old School Funk and talk box". The album finds back to the right order with Everything. A delightful R&B tune with Eddie Hall's cajoling vocals. Sunny Day and Open Arms (Vocals) are further R&B pieces featuring Eddie Hall's awesome voice. A second Luther Vandross. 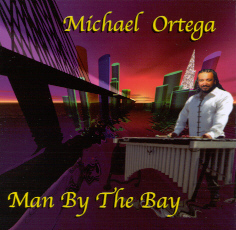 Michael Ortega's album "Man By The Bay" has something for all. Fans of R&B music, Acid Jazz, Smooth Jazz will find their respective tailored tunes. Take this album as a treasury for all occasions.